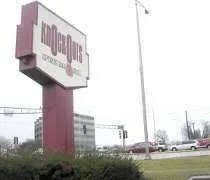 Knockouts is a typical sports bar. We walked in to find a pretty empty dining room. There’s a big island bar in the middle. There’s a couple different dining spaces with different types of tables and chairs. When you first walk in, there’s a raised area with nice wood chairs and tables. Along one wall near the bar is a series of pub tables. Since there was five us, I headed towards a table in the larger area. There was one table for six near the back, but it was right next to the jukebox…and that jukebox was LOUD. I walked away from it and pushed two tables together. The MSU game was a couple TV’s and the NASCAR race was just starting so we had plenty of entertainment. The menu is typical sports bar. Lots of sandwiches. I ate nothing but crap the day before, so I wasn’t in the mood for a burger. Instead, I ordered a turkey and swiss panini on wheat. The sandwich was really nothing more than a pile of turkey, a slice of cheese, and two pieces of wonder bread that had been toasted. It was good and there was a lot of turkey, but it wasn’t really a panini. The sandwich came with fries so I didn’t leave hungry. J ordered a buffalo chicken wrap. Again, typical buffalo chicken wrap except this one came with a lot of chicken. After eating about half, she usually opens the wrap up and finishes it that way. She opened the wrap to find a goldmine of chicken. She gave me a couple big spoon fulls and she still had more than she could eat. The chicken was hot, but not so hot that it dulled the taste buds. My dad, of course, ordered a patty melt. My dad likes patty melts like I like burgers. It’s funny. You can always guess what he’s going to order. As long as I find a restaurant that has a patty melt, I know he’ll be happy with dinner. His sandwich was a hamburger on two pieces of wonderbread with grilled onions. It didn’t really look like what I picture a patty melt as, but he seemed to like it. My mom got a fajita chicken wrap. Like J’s, it was a large wrap with a lot of chicken. She was able to conquer most of it, but ended up giving me a lot of her fries because there was just too much food on the plate. My aunt ordered a philly cheesesteak. It wasn’t a philly cheesesteak in the traditional sense, but it was sliced beef with grilled onions, peppers, and cheese. 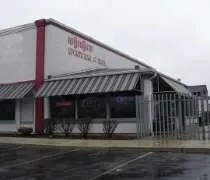 It really looked like more of a non-Chicago version of an Italian beef or a french dip without the dip. There was no cheez whiz, so I don’t know how they can call it a philly cheesesteak. No matter what you call, she loved the sandwich. Out of the five of us, I think she liked her sandwich the most. The bill for five people was just under $50. Not bad for a lunch where nobody left hungry. Knockouts is an interesting bar. It’s a nice little sports bar, but at night, they seem to do a lot of hip hop and it turns into more of a nightclub. During our lunch, the waitress kept feeding the jukebox and the music was insanely loud. It was so bad it was hard to really have a conversation without yelling. They had the volume up on the MSU basketball game and I would have rather listened to that….especially because we were in a sports bar. We got about a ten minute break from the music, but eventually, she went back over and put on more crappy music. That was really the only downside to our meal. Knockouts wasn’t our first choice, but it turned out to be a pretty good meal.